I have a short attention span always having to move onto some new project so with the charity lapghans I've been exploring the fastest way to hook them together. I'd prefer to hook than sew. So my first lapghan was a two-stage process after sewing in the ends: single crochet around, then single crochet together. However this creates a ridge on one side which was not pleasing to me. 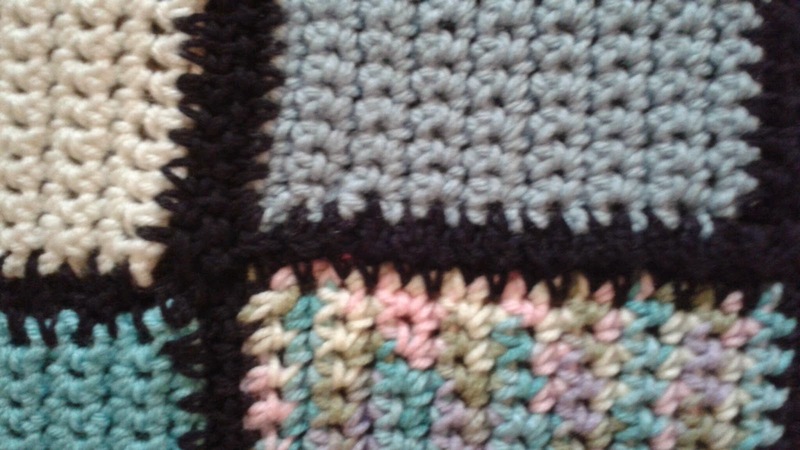 For the latest one I used a single crochet to first, chain 1, single crochet to second, chain 1 join making a feature of the join and since my squares differed in size and stitch number with different contributors sometimes I could lose a stitch by single crocheting in the same space. 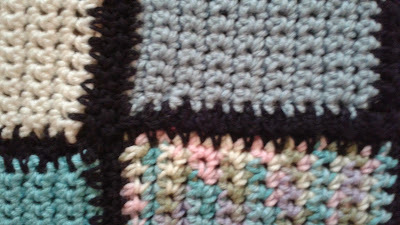 The end results is fab (see charity lapghan #5 in my previous post). Have managed to recruit a second joiner to the group who can offer me a little respite. I need a break!